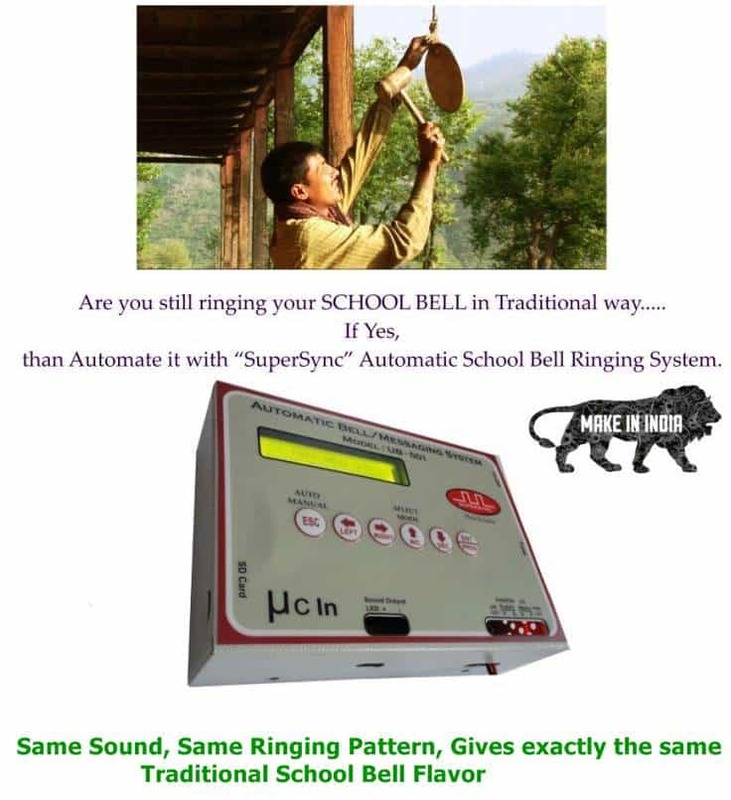 APPLICATIONS of Automatic School Bell Multiple Sound: Schools, Colleges, Education institutes, coaching institutes etc. 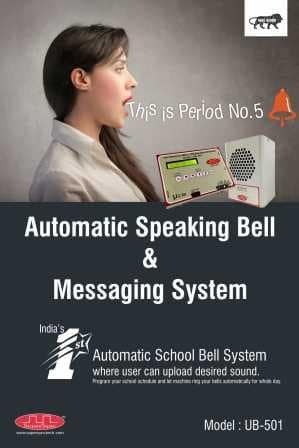 Pre-loaded Sound: Micro-SD card will come with pre-loaded sound files in female voice narrating “Period No. 1, Period No. 2, Lunch Time” and likewise. of Schedules: 24 different Time table schedules can be programmed in this model. Out of these 24 Schedules any schedule can be selected to ring on any weekday. These 24 Schedules will include user’s Half Day schedule, sessional/term tests schedule, exam schedule, winter/summer schedule, annual day / sports week schedule etc. Weeperiods strong>Holiday: Multiple days can be programmed as weekly holiday i.e. weekly holidays can be 1 day or 2 day or all 7 days of week. 3 Modes: There are three different modes named as Summer Mode, Winter Mode and Exam Mode. 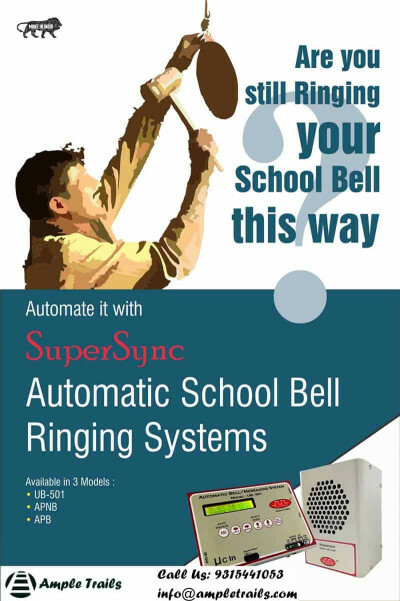 This facilitates user to pre-store 3 different set of schedules for 7 days of week to cover whole year’s time table. Output Attachments : Sound Box (Ampli-Speaker) or any branded Amplifier and Speaker System (PA System) can be connected with this model. 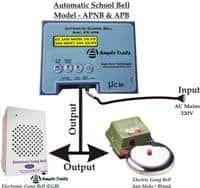 Amplifier Supply Output : 220V 50Hz | 08 Ampere | For auto ON-OFF of Amplifier’s power Supply at bell time. 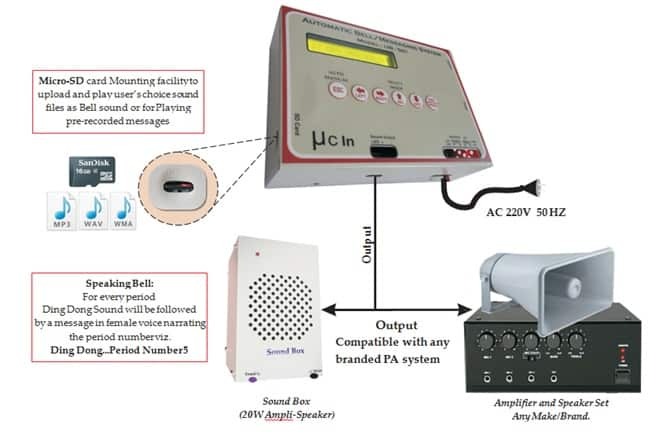 Sound Output : This output needs to be connected on AUX In terminal of Amplifier or at Sound Input Terminal of Sound Box. 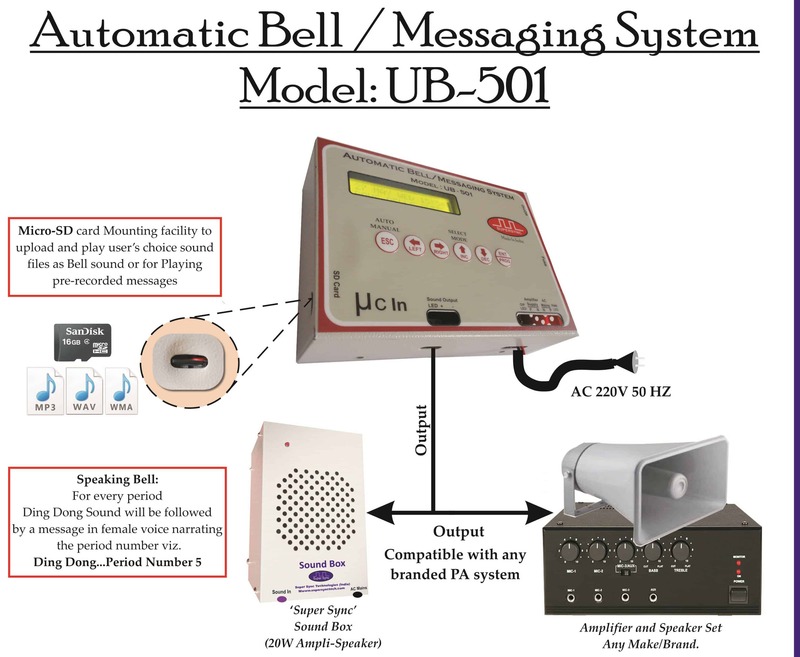 Weight: Control Unit: 1 Kg and Electronic Sound Box: 1.5 Kgs. Email us at info@ampletrails.com or call us at 9818390836 for more info. 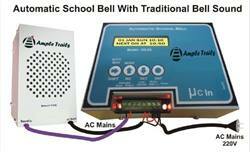 We are the top Automatic School Bell Suppliers in India Contact us for Automatic School Bell.